WestJet has taken the next step to becoming a full-service, long-distance carrier. The first three of 10 Boeing 787-9 aircraft to be delivered early next year will be based in Calgary and operate to several European destinations, including London Gatwick, currently served by a 767. Each aircraft will carry 320 passengers in a three-class cabin configuration, including the company’s first business cabin featuring 16 private pods with lie-flat seats, and an upscale premium economy cabin with a self-service bar. Calgary International Airport opened a new $2 billion, 24-gate international terminal in 2016 to support U.S. and intercontinental services. Hainan Airlines, China’s fourth largest, introduced nonstop 787 service between Beijing and Calgary ahead of the opening of the new terminal. Air Canada launched a nonstop service between Calgary and Tokyo using a completely refurbished 767-300 ER. Even so, the airport is thought to be underserved globally. Ed Sims, WestJet’s chief executive recently told the Calgary Herald editorial board that Calgary was chosen for the first Dreamliners because it’s so underserved. “We have got this fantastic opportunity to really turn Calgary into an absolute, genuine, international transatlantic hub,” he said. WestJet is Calgary’s largest airline and is expected to offer an average 1,100 flights per week by June 2019. This summer, WestJet and Delta Air Lines, the U.S. fourth largest carrier, bulked up on an existing code sharing agreement with a transborder joint venture arrangement that, if approved, will solidify services through a more integrated network with coordinated schedules and fares, improved airport connections and shared products such as loyalty programs. Together, WestJet and Delta account for approximately 28 per cent of the transborder market, versus Air Canada’s 44 per cent market share. “Delta’s future is global and together with WestJet, we can augment the two airlines’ capabilities in this important transborder market,” said Ed Bastian, Delta’s chief executive. Including potentially plugging into WestJet’s expanding global network. In addition to the U.K. the airline will introduce 787 service to Dublin and Paris, two destinations already served from Atlantic Canada using 737 MAX 8 equipment. These will be the first scheduled services to Dublin and Paris from Calgary. WestJet will not enjoy the same cost advantages in the global market that it traditionally held domestically. Even that gap has narrowed as unionization and the ongoing transformation to a full-service carrier, including the launch of its Swoop, ultra-low-cost subsidiary have driven up operating costs. In recent years, costs have outpaced revenues, resulting in a second quarter loss of $28 million. The airline plans to reduce operating costs by $200 million over the next two years, while expanding Swoop and integrating the 787 into the mainline fleet. 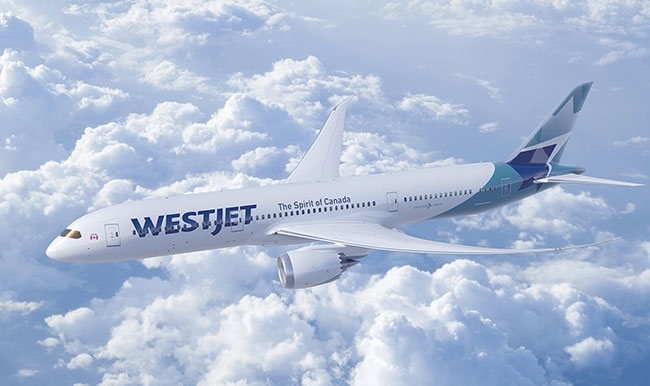 While the 787’s 14,000-kilometre range will enable WestJet to compete on longer-range routes to Asia and Latin America, the airline is comfortable for now to minimize the risk of introducing expensive new equipment by deploying the aircraft on familiar routes. All three business units, Swoop, Encore the regional airline and the mainline carrier will feed traffic into the international route network. The first three 787s will arrive in Calgary in the first quarter of 2019. The aircraft will operate on domestic flights for crew training and regulatory compliance before the first scheduled international flight in April. Hub locations and routes for the remaining seven aircraft have not yet been announced. WestJet also has options for an additional 10 aircraft to arrive between 2020 and 2024.